I scanned the carpet’s field expecting to find a flamboyant dragon spewing fire, but I couldn’t make out anything at all resembling a dragon or a serpent. In the centre of the carpet there was, however, an interesting form that appeared somewhat insect-like. “You mean this thing in the middle that looks like a cockroach?” I asked innocently. The dealer gave me a puzzled look and hesitated to respond—he must have been struggling to determine whether my question was sarcastic, or prompted by sheer cretinism. This was one of those moments when my abject ignorance of the finer things in life was mercilessly exposed yet again, akin to the time when the wine-tasting instructor had said that a particular merlot displayed “aromas of currant and coffee, with complex flavours of cinnamon, plum, and cedar that finish with firm but mature tannins”, whereas I couldn’t help thinking that it tasted a bit like cough syrup. After the awkward episode at the carpet dealer’s, it was high time to educate myself on the basics of carpet semiotics, with the help of a few books and the oracle of our times—the Internet. After some searching I discovered that the carpet motif that had revealed my lack of erudition represented neither a cockroach nor a dragon, but the scarab beetle, a common motif in Caucasian and Persian tribal rugs, especially Qashqai rugs. Encouraged by this discovery, I ventured into a dense forest of motifs and symbols that are found, with varying frequency, in tribal carpets and kilims from Anatolia, Persia and the Caucasus. Here are some of the most important ones. The hands-on-hips motif is Anatolian in origin and represents a mother goddess figure, sometimes depicted with a child in her womb. It is a symbol of motherhood, fertility, and abundance. The ram’s horn symbolizes manhood, male fertility, strength and bravery. A weaver incorporating such a symbol into her carpet would wish for all these qualities in her future husband. The bereket essentially combines the hands-on-hips and ram’s horn motifs, uniting male and female fecundity in an intricate pattern that suggests, ahem, the process of reproduction. The boteh is a symbol that has been used to decorate textiles in Persia at least since the Sassanid Dynasty(200–650 AD). The word itself may have meant bush, shrub, or simply a cluster of leaves. As a motif it has many interpretations. In some cases it is described as a seed symbolising life and renewal, often enclosing a mature plant within it, as if to suggest that the whole always exists within the part. Many believe it is the convergence of a stylised floral spray and a cypress tree, which is a Zoroastrian symbol of life and eternity, much like the tree of life elsewhere. Because of this association with Zoroastrian tradition, the boteh is sometimes referred to as the flame of Zoroaster—the eternal flame that burns continuously in Zoroastrian temples. The boteh is also the precursor of a much-loved Western pattern—paisley. The tree of life is a symbol common to many monotheistic religions. Echoing the story of the garden of Eden, it reminds us of man’s aspiration to become divine—its fruit is believed to bring immortality, and therefore it is forbidden. Mankind, unable to eat this fruit, must place all hope in life after death. Thus the tree of life becomes a symbol of the afterlife, of immortality, and of hope. In carpet design, the tree of life can appear in figurative form, such as in this Persian rug (left image), but also in more stylised interpretations, such as in this Obruk prayer kilim (right image). Protective motifs have a special place in tribal rugs. 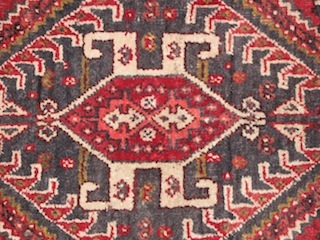 They were used on kilims especially to protect marriages, spouses, family members, children, houses and grain, animals and other possessions against the evil eye, against ill-will, against natural catastrophes and against dangerous animals. Many of these motifs share some fundamental features, such as the overall diamond shape and the hooked or crenellated perimeter, such that they tend to blend together and become almost indistinguishable. They include stars and crosses, stylised dragons and scorpions, evil-eye amulets, hooks, eight-pointed stars, Leshgi stars and burdock burrs. 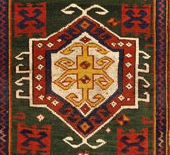 The gul (sometimes gol or göl) is a medallion of octagonal or angular shape used in Turkmen designs. 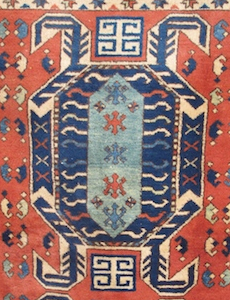 It is often found in a repeating, all-over pattern in the main field of Turkmen rugs, bags and other weavings. The term “gul” is of disputed origin. It may come from the Persian word for flower, or the Turkish words for rose, or roundel, or even lake. There are many different types of gul, many of them associated with specific Turkmen tribes from which they take their name. Thus, there are Tekke guls, Salor guls, Ersari guls, Yomut guls, and so forth. Identifying which tribal tradition a gul belongs to, however, can be extremely difficult, not only because many guls are quite similar, but also because gul designs, despite their tribal moniker, were rarely exclusive to one tribe. 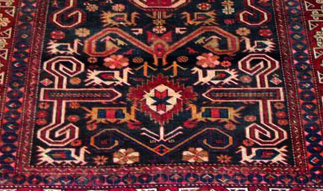 In modern rugs, guls are used freely by non-Turkmen carpet weavers as well. It is important to remember, of course, that these traditional tribal motifs almost always appear in highly stylised forms that may be difficult to reconcile with their colourful names, or to distinguish from one another. Tribal motifs manifest themselves in such highly stylised imagery not only because of the restrictions imposed by Islamic tradition, which never favoured figurative art, but also because of the practical limitations of weaving and knotting techniques, which often dictated simplification of forms and the portrayal of real-life shapes as geometric designs. Moreover, it would be misleading to over-romanticise the symbolism of these motifs, in spite of the elaborate and lively stories that a crafty carpet salesman may offer when asked about them. Many of these motifs are very ancient and animistic in origin, pre-dating Islamic and Christian times. They may have articulated profound beliefs held by the tribal weavers who created them—meanings built around the most important concerns in their lives, such as birth and death, marriage and fertility, spiritual calling and the afterlife. These meanings, however, may also have receded from consciousness as nomadic and tribal ways of life faded; the mythologies and folkloristic narratives associated with them are for the most part lost. What remain are time-honored, familiar patterns passed on from one weaving generation to the next. In some cases, the name of a motif, and its associated symbolism, may have been invented ex post facto to describe a form already well established in the carpet-making tradition. For the modern lover of oriental rugs, these motifs constitute, above all, a rudimentary vocabulary used to describe, and to some extent to codify, the dizzying complexity and variety of designs found in tribal rugs woven across the ancient Silk Route. Indeed, so extensive is this vocabulary that I will have to devote another post just to cover border motifs… Stay tuned! In this video, Yara Elmjouee goes back to Iran’s history to focus on Iranian Art & Architecture. Watch the video posted below to learn more about architecture and art in Tehran, Iran! In this video, Pedram Khodadadi introduces Niavaran Palace. He goes back to history to give the audience more details on the complex. Take a look at the video posted below to learn more about the Niavaran Palace in Tehran, Iran. In traditional Iranian architecture, Saghakhaneh is a place where people would come to light a candle and drink some water. Victor Farmand will tell you more. In this video, Bianca Rahimi takes us to Persian Gulf’s biggest Island: Qeshm. Watch the video posted below to learn more about the Persian Gulf’s biggest Island! In this video, Shahriar Azimi meets a couple of Iranian female rock climbers who truly rock in what they passionately pursue as their career and hobby. Watch the video posted below to learn more about Mountaineering in Iran! In this video, Reza Nayebi shows you two of the finest hotels in Iran. Watch the video posted below to learn more about some of the best hotels in all of Iran! Watch the video posted below to learn more about Iranian Furniture making! One of our favorite rituals ahead of the Persian New Year is a fire festival on the eve of the last Wednesday of the outgoing Persian Year. So on the last Tuesday night of the year when the sun goes down, bonfires are lit all over Iran. As a custom of bidding evil adieu and welcoming hope and joy, we jump over bonfires saying an epigram out loud. And that, is just one of our customs for Chaharshanbeh Soori. Watch the video posted below to learn more about the Chaharshanbeh Soori festivities!